The Politics of Mass Society explores the social conditions necessary for democracy and the vulnerabilities of large scale society to totalitarian systems. Mass movements mobilize people who are alienated from the social system, who do not believe in the legitimacy of the established order, and who are therefore ready to engage in efforts to destroy. Contrary to the psychological approach prevalent in European doctrines of mass movements, Kornhauser persuasively argues that social order is the critical factor. The greatest number of people available to mass movements are located in those segments of society that have the fewest ties to social order. The book draws on a wide range of materials--from classical political theory contemporary sociological analysis, historical and intuitional studies, public opinion surveys, and other published and unpublished data. Kornhauser selected political phenomena in organizations, communities, classes, and whole societies. He examined support for communism and fascism in a variety of countries in relation to rates of urbanization and industrialization, employment, and suicide and homicide among other phenomena. 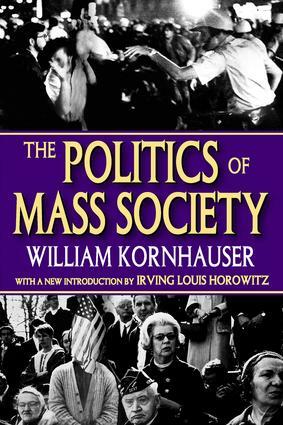 In his new introduction, Irving Louis Horowitz identifies Kornhauser's book as a seminal work of the great tradition in political sociology in the mid-twentieth century. Kornhauser points out that modern democratic systems possess a distinct vulnerability to mass movements. He spells out and identifies factors that tend to increase or decrease this vulnerability--not least the health and strength of elites. In this way, the book reveals new clues to the origins and nature of mass political movements. The Politics of Mass Society remains the most complete analytical account of the sociological approach to mass society in advanced industrial societies.